Tebow goes out with best game ever! 31-35 for 482 yards and three touchdowns and another rushing! 533 total yards! 20-23 with 12 straight, and 320 yards in the first half! 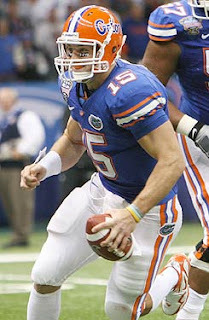 How will the Tebow haters explain that game, as Florida crushes Cincinnati 51-24! It was Urban Meyer's 55th game coaching Tebow. As any biblical scholar versed in kabbalah/gematria and pseudo mysticism knows, 55 is the number of the gift, and the game was a gift to Florida fans. Tebow's eye-black? Ephesians 2:8-10, which touted the eternal gift. That must make the Tebow-haters cringe even more! The best performance ever in a BCS game and it was done by a bible believing, eye-black wearing, quarterback, who was auditioning for the NFL at the expense of the Bearcats! So for all you Tebow haters out there, I just have two words for you. Hey when it really counted (game against Alabama) he couldn't do it :P Then again I'm just a bitter Trojans fan! They needed the Capra moment instead!